Manabi uses research-backed adaptive learning techniques so you can learn at your own best speed. Learn new words, and Manabi will make them stick. Come join an online community of 日本語 learners! 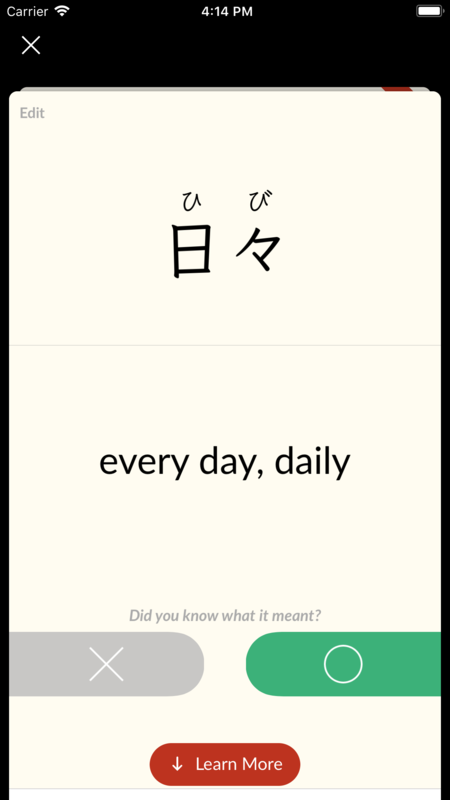 Optimize your Japanese through adaptive-learning flashcards. Download now to get going. Manabi optimizes what and when you learn to make the most of your time. With its state-of-the-art spaced repetition algorithm, it'll remind you to review cards right as you're likely to forget them to maximize efficiency. If you fall behind, Manabi prioritizes the highest-impact cards rather than guilt-trip you about it. Learn more than just "the answers". Example sentences from native speakers on Twitter and Weblio are pulled in automatically, as well as relevant StackExchange Q&A. Just scroll down on a card to learn more and make those memories more vivid so that they stick! Users can share decks for others to subscribe to, with automatically-synced updates. Manabi is a community of Japanese learners, and comes with handy pre-built decks out-of-the-box. One of the best ways to learn Japanese is by reading native materials. Use our companion app, Manabi Reader, for one-touch dictionary look-ups that let you seamlessly add flashcards into Manabi for the words you come across.